In this post i will write about a problem you can get in if you use a loop variable in a lambda expression or anonymous method. If you use an external variable within a lamabda expression the c# compiler generates a closure that includes the external variable and so the lambda can use the value of this variable. That normaly works good but if you use a loop variable within the a lambda and compile it with a c# 4.0 compiler you get a worng result. 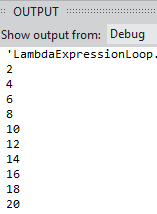 In the following code segment i build ten lambdas including the loop variable. That means a closure is build for every lambda. 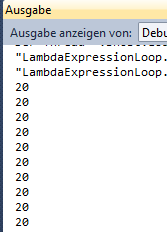 I save the lambdas to the list and when the loop ends i execute the ten lambdas. 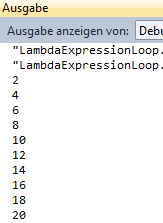 As you see the c# 5 compiler builds the closures correct with the correct loop variables. If we want to get the correct value with the c# 4 compiler we must use a local variable. In the following code segment the loop value is assigned to a local variable. Now the compiler builds the correct closure. So i am glad that Microsoft fixed this problem. It was easy to fix but i think now it works much more logical.